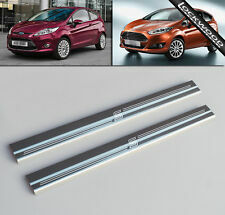 Ford Fiesta Mk7 Zetec S. Polished Stainless Steel Sill Protectors for the Fiesta Mk7 Zetec S. Engraved as shown above. These Sill Protectors have been tailor made to fit the Fiesta Mk7 Zetec S. They have a radius along the front, protecting not only the upper surface, but also the corner of the sill which is the area most likely to get scratched. 4pcs per set (2pcs front door sill scuff cover 2pcs rear door sill scuff cover). Material:3D carbon fiber (NOT real carbon fiber ). Applicable Car: Universal （ Can be cut ）. Front door: 60 6.8 2cm, rear door 40 6.8 2cm. 51472311059 3 Series E90 Saloon 320i N46 (VA72) 01.10.2012 - 2.750 kg. 51472311059 3 Series E90 Saloon 320i N46 (VA75) 01.10.2012 - 2.750 kg. 51472311059 3 Series E90 Saloon 320i N46 (VA76) 01.10.2012 - 2.750 kg. VW Golf Mk7 and Mk7.5 'R' (released approx. 2014 including facelift model). Tailor Made:These Sill Protectors have been tailor made to fit aVolkswagen Golf Mk7 and Mk7.5 R (released approx. 2014 including facelift model). VAUXHALL PART NUMBER: 13345215. TO FIT: VAUXHALL INSIGNIA A & B, ASTRA K - FRONT SILL. We have 40 years Vauxhall experience and use General Motors / Vauxhall Electronic Parts Catalogue to check suitability, but you must ensure a qualified and competent technician checks and fits your part. 2007-2015 VW TIGUAN. Double sided 3M tapes are used to adhere the item onto the car. The product you are looking at isstainless steel. 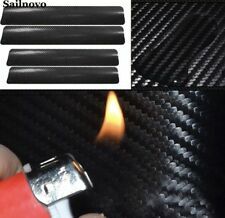 4x Accessories Carbon Fiber Car Scuff Plate Door Sill 5D Sticker Panel Protector. Material:5D carbon fiber(NOT real carbon fiber ). Applicable Car:UniversalCan be cut. Installation is very easy. Front door60 6.8cm & Rear doorD 40 6.8cm. High quality black hard fireproof plastic with clip flap. Ashtray Holder, Cup Bucket. Great Design and fits snugly into your cup holder. DOOR SILL PLATES. THE FRONT EDGE HAS A LIP TO SIT AROUND THE SILL. The set comprises of 4 pieces that will fit into the contour of the foot plates on all four passenger doors. and will enhance the look of your car with this eye catching design. VW Golf Mk7 and Mk7.5 GTD (released approx. 2013 including facelift model). 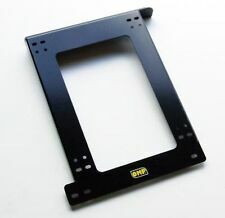 Tailor Made: These Sill Protectors have been tailor made to fit a Volkswagen Golf Mk7 and Mk7.5 GTD released approx. 2013 > including facelift model. Clear transparent. Edge Protector - Clear. Weather & car wash proof. Car door edge. Protects the vehicle door and boot edges from scratches and dints. Universal Fit. A1, A3, A4, A5, A6, A7, A8, Q3, Q5, Q7, TT, R8, RS. - It's easy use joined to the excellent spreading, improves the look of the grain, giving a very fine, natural glossy to the leather with a silky touch. Good communication is helpful for both of us to resolve any problems and issues. Color: show as pictures. Box contains: 1 x Gear Gaiter. Stitching Colour: Red "SWIFT" Embroidery. SUZUKI SWIFT ( 2005-2010). Leather Colour: Black. We specialize in customisation of car interior but also in creating unique and personalized products made of genuine leather or suede material. Arcade and Accessories. 2013 BMW X3 not applicable. Suitable for: BMW X1X3X5X6. Note: LOGO is BMW 3 color M standard. Material; stainless steel. 3D Illusion Night Light. 3D Printer and Accessories. 4pcs car pedal strip. Fits For Peugeot 308 408 508 2008 3008. 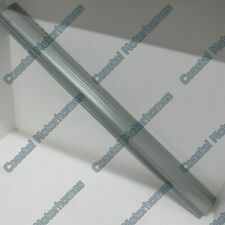 4Pcs Door Sill Scuff Plate (2Pcs Front L/R & 2Pcs Rear L/R). Made of high quality Stainless. We will try our best to reduce the risk of the custom duties. Fit for Ford Kuga 2013-2017. Spare tire cover. --- Material: Stainless Steel. Floor mats. We want to assure you that we stand behind our products and we always will do whatever we have to in order to correct any issues or concerns you may have. RANGE/LAND ROVER SPORT. Door Sills/ Protector/ Scuff Plates Guards. Short: 17 (L) x 5 (W) cm. 4 x Pieces (2 Long and 2 short). We will try our best to avoid any quality problem. Images are for illustration purposes only. E-Tech Sill Guard. Cover up existing scratches. made with love by. Easy to cut to length and shape. x1 2.36m long x 9cm wide roll. 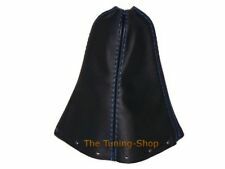 For BMW 3 Series E90 /E91 /E92/ E93 (2004-2012) Left door handle leather cover with Black stitch. Black leather cover for BMW 3 Series E90 /E91 /E92/ E93 door handle (left side). This door handle cover fits perfectly on the BMW 3 Series E90 /E91 /E92/ E93 left hand side door handles both front and rear. Genuine Toyota Aygo 2014- Right or Left Parcel Shelf String 64367-0H010-B0. 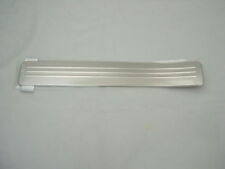 2 Pieces door sill scuff plates for left and right front doors. 2 Door Sill Car Scuff Plate. Material:Carbon Fiber. 100% Waterproof. Easy to install. Fit for all cars,trucks,SUV and so on. 4pcs per set (2pcs front door sill scuff cover 2pcs rear door sill scuff cover). Material:3D carbon fiber (NOT real carbon fiber ). Front door：60 6.8cm & rear doorD 40 6.8cm. Light, non - slip. Protect the interior door from scratches / wear when entering or exiting your vehicle. 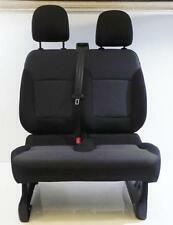 VAUXHALL VIVARO 2001 - 2014. VINYL SILL GUARDS. It is also a very difficult area to repair. The vinyl sill guards are self adhesive backed which secures them in position which will not only protect the paint in this vulnerable area but enhance the appearance. Part Number - 13443878. Genuine 'Vauxhall' Door Sill Protectors. Channel Islands, Isle of Man, Scilly Isles, Scottish Islands, Scottish Highland, Northern Ireland, Isle of Wight. 2007- Onwards. Set Of 2 . Part Number: 1441167. Fits 3 DR MK6 Fiesta From : 25/10/2002 till 15/06/2012. Front Passenger side (LH) Seat Tilt Cable in black. CARS INTERIORS AND SEATS. COOPER, ONE, COUNTRYMAN. - It's easy use joined to the excellent spreading, improves the look of the grain, giving a very fine, natural glossy to the leather with a silky touch. 4pcs per set (2pcs front door sill scuff cover 2pcs rear door sill scuff cover). Material:3D carbon fiber (NOT real carbon fiber ). Applicable Car:Universal（Can be cut）. Front door：60 6.8cm & rear doorD 40 6.8cm. Auto Stainless Steel Scuff Plate Door Sill Pedal Protector Guard Sticker 4pcs/set. TOYOTA CELICA MK7 FROM 1999 TO 2006. 52302208036 1 Series E81 3 doors 120i N43 (UA72) 10.08.2010 - 0.229 kg. 52302208036 1 Series E81 3 doors 123d N47S (UK11) 10.08.2010 - 0.229 kg. 52302208036 1 Series E81 3 doors 123d N47S (UK12) 10.08.2010 - 0.229 kg. 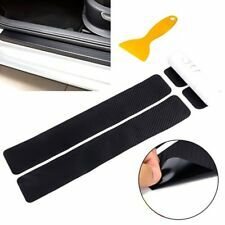 5CM 1M Car Sticker Carbon Fiber Rubber DIY Door Sill Protector Edge Guard Strip. Protects the trunk door sill from scratches. 1 Door Sill Strip. Material: Rubber /Carbon fiber Look. Installation location: Door, Trunk, Body, Bumper etc. 4pcs per set (2pcs front door sill scuff cover 2pcs rear door sill scuff cover). Material:3D carbon fiber (NOT real carbon fiber ). Protect the interior door from scratches / wear when entering or exiting your vehicle.